Yetunde Simpson was born on the 3rd of May 1963 into the Durosinmi-Etti family of Okepopo in Lagos Island. On completion of her Primary school education at Ireti primary school, Ikoyi, she proceeded to Holy Child College, Obalende, after which she studied for her A-Levels at Federal Government College, Lagos. She obtained a Bachelor of Arts Degree in Philosophy at the University of Lagos in 1986 and completed the mandatory National Youth Service at the Logistic Management School, TTG, Nigeria Air Force Base, Kaduna in 1987. 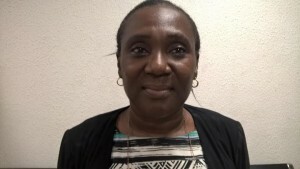 She started her working career with Health Aid Limited as a procurement Officer from 1988 to 1990, after which she joined the then Eko International Bank from 1990 to 1994, as a Graduate Trainee and leaving as an Assistant Manager. She began her career with the Lagos State Civil Service as a Tourism Officer II in 2000 and presently serves as an Assistant Director and Head Tourism Research and Development in the Ministry of Tourism, Arts and Culture. She was a member of the Lagos State Hotel Grading and Classification Review committee. Mrs. Simpson loves cooking, reading and organizing events. Previous BARRISTER OWOEBUTE- OKEDEJI – ASSISTANT DIRECTOR AND HEAD OF LEGAL UNIT.